1 Availability of rewards varies by country. For more information, see http://www.hp.com/go/learnaboutsupplies. 2 Based on HP internal testing, using paper with the ColorLok® logo. 3 Based on paper-industry predictions for acid-free papers and Original HP inks; colorant stability data at room temperature based on similar systems tested per ISO 11798 and ISO 18909. 4 Compared with HP 933 Magenta Ink Cartridges. For more information, see http://www.hp.com/go/learnaboutsupplies. High-capacity cartridges not included; please purchase separately. 5 Program availability varies. Original HP cartridge return and recycling is currently available in more than 50 countries, territories and regions in Asia, Europe, and North and South America through the HP Planet Partners program. For more information, visit http://www.hp.com/recycle. 6 Program features and availability may vary by country. For more information, visit http://www.hp.com/learn/suresupply. 1 Availability of rewards varies by country. For more information, see http://www.hp.com/go/learnaboutsupplies. 2 Based on HP internal testing, using paper with the ColorLok® logo. 3 Based on paper-industry predictions for acid-free papers and Original HP inks; colorant stability data at room temperature based on similar systems tested per ISO 11798 and ISO 18909. 4 Compared with HP 933 Cyan Ink Cartridges. For more information, see http://www.hp.com/go/learnaboutsupplies. High-capacity cartridges not included; please purchase separately. 5 Program availability varies. Original HP cartridge return and recycling is currently available in more than 50 countries, territories and regions in Asia, Europe, and North and South America through the HP Planet Partners program. For more information, visit http://www.hp.com/recycle. 6 Program features and availability may vary by country. For more information, visit http://www.hp.com/learn/suresupply. 1 Availability of rewards varies by country. For more information, see http://www.hp.com/go/learnaboutsupplies. 2 Based on HP internal testing, using paper with the ColorLok® logo. 3 Based on paper-industry predictions for acid-free papers and Original HP inks; colorant stability data at room temperature based on similar systems tested per ISO 11798 and ISO 18909. 4 Compared with HP 933 Yellow Ink Cartridges. For more information, see http://www.hp.com/go/learnaboutsupplies. High-capacity cartridges not included; please purchase separately. 5 Program availability varies. Original HP cartridge return and recycling is currently available in more than 50 countries, territories and regions in Asia, Europe, and North and South America through the HP Planet Partners program. For more information, visit http://www.hp.com/recycle. 6 Program features and availability may vary by country. For more information, visit http://www.hp.com/learn/suresupply. 1 Availability of rewards varies by country. For more information, see http://www.hp.com/go/learnaboutsupplies. 2 Based on HP internal testing, using paper with the ColorLok® logo. 3 Based on paper-industry predictions for acid-free papers and Original HP inks; colorant stability data at room temperature based on similar systems tested per ISO 11798 and ISO 18909. 4 Compared with HP 932 Black Ink Cartridges. For more information, see http://www.hp.com/go/learnaboutsupplies. High-capacity cartridges not included; please purchase separately. 5 Program availability varies. Original HP cartridge return and recycling is currently available in more than 50 countries, territories and regions in Asia, Europe, and North and South America through the HP Planet Partners program. For more information, visit http://www.hp.com/recycle. 6 Program features and availability may vary by country. For more information, visit http://www.hp.com/learn/suresupply. 1 Availability of rewards varies by country. For more information, see http://www.hp.com/go/learnaboutsupplies. 2 Based on HP internal testing, using paper with the ColorLok® logo. 3 Based on paper-industry predictions for acid-free papers and Original HP inks; colorant stability data at room temperature based on similar systems tested per ISO 11798 and ISO 18909. 4 Program availability varies. Original HP cartridge return and recycling is currently available in more than 50 countries, territories and regions in Asia, Europe, and North and South America through the HP Planet Partners program. For more information, visit http://www.hp.com/recycle. 5 Compared with individual HP ink cartridges. Based on estimated U.S. street price. Actual retail pricing may vary. 6 Compared with individual HP ink cartridges. Based on estimated U.S. street price. Actual retail pricing may vary. Looking to stock up on ink for your home office or work printer? HP® has everything you need to ensure that you're ready to print thousands of pages at a moment’s notice. From color toners to black ink cartridges, you can order ink essentials here. 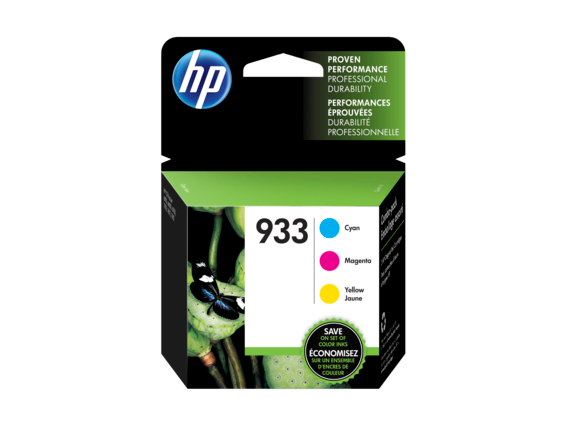 Save when you pick up your high-quality HP 932 ink and 933 ink directly from our website. Stocking and replenishing the ink for your printer has never been easier. Have your cartridges delivered straight to your door to avoid the lines and hustle and bustle of office supply stores. We offer fast, free, next business day shipping for all your orders. Order every color and ink type for a variety of printers, whether you need HP 932 ink or HP 933 ink. We provide an array of high-quality ink cartridges that you can purchase with the click of a button. 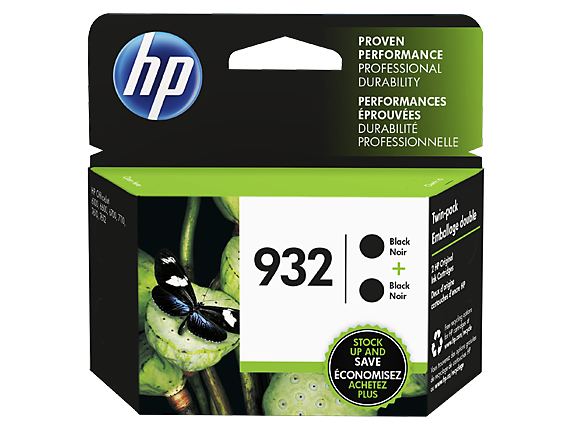 The HP 932 Black Original Ink Cartridge provides incredible value. Print up to 400 pages before you need to replace this cartridge with a new one. This high-end ink provides laser quality printing and sharp, distinct lines. Your HP InkJet or HP DeskJet 933 printer requires a specific, high-quality type of ink to perform at maximum efficiency; don’t waste your time and money on off-brands that will only underperform or damage your printer. This ink is water- and age-resistant, so your documents will last for decades to come without losing any legibility. For best results, we recommend using HP ColorLok? paper; it won’t fade with time and provides crisp, clear clarity. Pick up the HP 933 3-pack Cyan/Magenta/Yellow Original Ink Cartridges and avoid the hassle of purchasing individual ink colors for your printer. Tired of using your lunch break to run to the store to pick replacement inks for your printer? With the HP 932XL High Yield Black Original Ink Cartridge you can print up to 1,000 pages before you need to replace it, while our HP 933XL High Yield color cartridges in cyan, magenta and yellow, can print over 800 pages before you need to replace them. Do you have questions regarding the ink cartridges that are compatible with your printer? Our experts and technicians are standing by to answer all your questions regarding the best paper and ink to use for your printer. If you plan on buying in bulk or replacing your ink frequently, be sure to take a look at our HP Instant Ink. Not only will you save 50% on all your printer cartridge replacements, but we’ll prepare your order before you run out of ink. We offer a 50-, 100-, and 150-page enrollment plan. If your business or home office is constantly printing documents and burning through cartridges, this enrollment plan will save you bundles. We will automatically deliver your HP 932 and HP 933 ink cartridges as soon as your printer starts to get low. And not only will we deliver your new cartridges straight to your door, but we will also recycle your old ones, so if protecting the environment from unnecessary, harmful waste is a priority for you or your business, HP? is proud to recycle your cartridges. Every type of cartridge you need for your HP printer is right here; never worry about running out of ink again.